It’s no secret that I’m a goal planner. I’ve created goal planning posts and worksheets for years. If you haven’t seen them, check out this blog post or even this more recent blog post! I’m a planner in general. Sitting down and creating goals and planning how to achieve them is something that I’ve done my entire life. Whether I’m creating and planning personal goals or business goals, I write them down and happily check them off as I complete them!! Sitting down to work in the mornings with my daily planner and a latte. I review my to-do list and get to work! Planning goals is one of the many reasons why I still use a daily planner. I like to write down my goals for the day (small ones - like a to-do list) and I check them off or cross them off my list! It’s so empowering!! How to commit to a 90 day plan with free downloadable template. My inspiration for creating 90 day plans. What I have noticed recently are a few things; I schedule waaay too much into a small amount of time, I am project and deadline driven, and I need to keep my self interested and entertained! My biggest fault is not giving myself enough time to focus on one project or goal. I have decided to focus on one area of my business and allow myself more time to achieve less. Yup. You heard me! I am giving myself more time to achieve less!! You see, in our modern times, we are over scheduled, too busy, and time seems to be flying. Don’t you agree?! At the start of 2019 I dedicated myself to the fact that I would practice slow living (you can read more about that here). I realized that I’ve been racing through the weeks with far too much to do, in the shortest time possible and for what?! I’ve heard others complain about how busy they are, and that they don’t have any time. So I say, let’s make time! Make time for ourselves, for our businesses, family, friends etc. My 90 day goals; 1) paint and design more, and 2) create great content for my followers and subscribers. With my new way of scheduling goals and projects!! By giving yourself more time to achieve less!! I decided at the beginning of the month to spend the next 90 days focusing on two areas of my business and that’s it!! Just two! I have about a dozen moving parts and areas of my business that always need my attention, so this is a big deal for me! I am focusing on; 1) painting and creating new surface designs and, 2) marketing and providing great content for my followers and subscribers! That’s it! So when I suddenly have a new idea, or think of a new class I want to create, etc., I can easily make a note of my inspiration or idea and move it onto the next 90 day plan. Because right now, I am only focusing on 2 things; make art and create great content! It doesn’t mean that I’ll neglect another area of my business. It just means that for the next 90 days, I won’t spend more time than necessary to get what I need done in the other areas of my business. Focus on one or two things with this 90 day plan tracker. The great thing is, I have given myself a relaxed, long 90 day time frame to achieve my goals. 90 days is a an achievable timeframe to focus on one or two areas of your life. It allows for unproductive days, family days, holidays and “I’m feeling lazy today because it’s Monday, and it’s raining and I stayed up way to late watching the new season of Game of Thrones” days. You know what I mean right?! If you skipped a day or two along the way, it’s ok, because you’ve got lots of time to refocus and to carry-on! If the time frame was shorter, let’s say 30 days, if you missed a few days, you risk the chance of not achieving your goal, which leads to disappointment, but can also be discouraging too! 30 days is great for short goals, like getting back to a fitness routine, or for reading a new book or two, etc. But if you really want to achieve something, learn something new, create something new… you have to give it time and focus! Hence, the 90 day plan and template I created for you! Learn calligraphy in 90 days and use this simple template to help you keep track of your progress. Ok, so maybe you have a personal goal to learn something new. Let’s say you’ve seen my posts about learning calligraphy and you want to give it a try. Taking a class, and practicing for a few days isn’t going to make you achieve your goal of learning calligraphy. It’s a good start, but you won’t be writing greeting cards any time soon. Now, let’s say you took that calligraphy class, you committed to practicing every day (give or take a few episodes of GOT or that family function that is taking up your entire Sunday) for the next 90 days, well guess what?! At the end of 90 days, you are going to see so much improvement, and ease and muscle memory developed and style and, you WILL be able to write beautiful messages in greeting cards!! Why!? Because you gave yourself lots of time to focused on one thing. You practiced, make mistakes, made great strides in your physical ability to letter but also in your confidence too! Make sense?!! 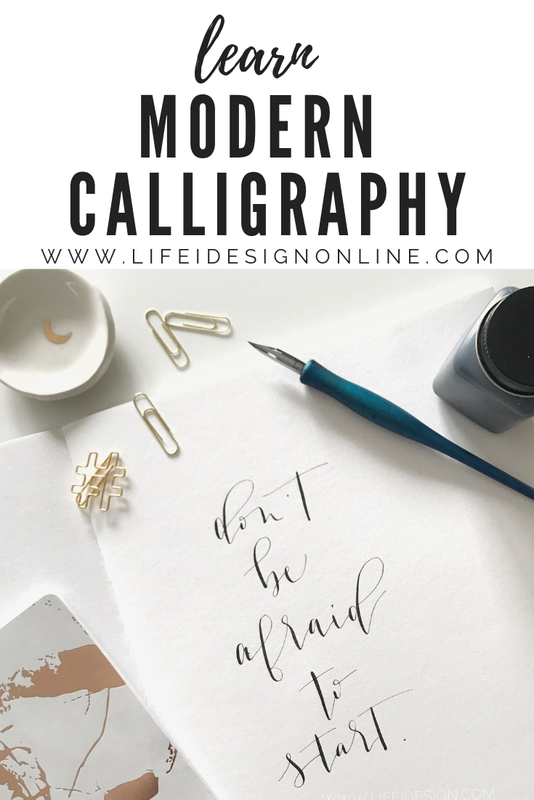 Spending 90 days learning calligraphy will have you writing quotes in no time! How do you get started on your own 90 day plan?! Ok, so all you have to do is decide on one thing to focus on in your personal life or your business then subscribe to the Creative Library to download your free 90 day plan template tracking sheets, so you can keep track of your goal, check-off the days you were able to spend on your goal and use it as a way to celebrate your achievement over the next 90 days!! If you subscribe to my Creative Library, you’ll have already noticed this 90 day plan template in the library. If you are not a subscriber, make sure to sign up so you don’t miss out on all the free goodies designed to help inspire you and to get the tools that I personally use and recommend! I’m curious what your first 90 day goal is!! Please share it with me, tag me, email me. I’d love to see what you have planned! Subscribe to get this 90 day plan and more! We respect your privacy and will only send you an email once or twice a month! Access the free template in the Creative Library!